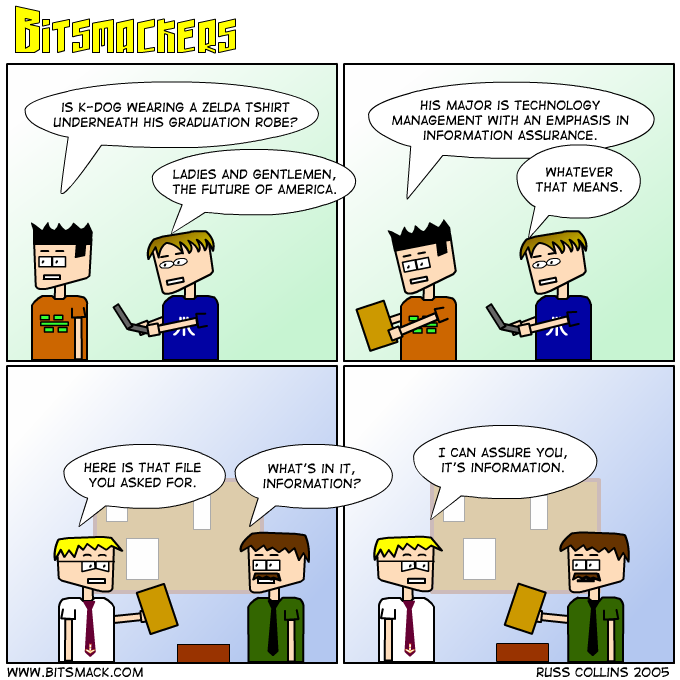 We’ve got a new <a href=http://www.bitsmack.com/modules.php?op=modload&name=Comics&file=index&action=comic&id=460>corporate drone</a> in the real world now. Resistance is pointless. It was a busy weekend. Friday night was the Tiger release and Hitchhiker’s Guide to the Galaxy. It was an excellent movie, I’ll put my full review in the podcast Thursday. Saturday we had K-Dog’s graduation, and then last night was the triumphant and hilarious return of Family Guy. I installed Tiger last night and decided to erase my hard drive and start over. I had a bunch of apps I wanted to get rid of because they were taking up space (Virtual PC). Dashboard is pretty cool and I can’t wait to see what widgets people come up with. The only problem I am having since the install is that my mouse pointer doesn’t seem as smooth as it used to be. I installed the Microsoft drivers for my wireless intellimouse, and turned the speed all the way up but it still doesn’t feel right. If anyone has any ideas let me know.